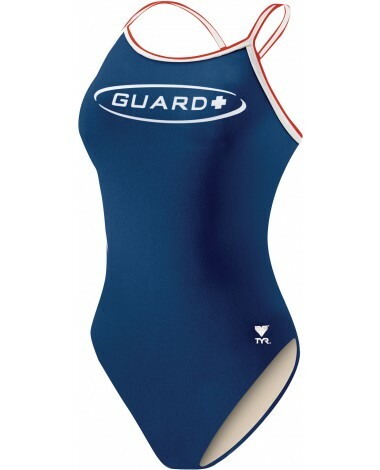 Durable, sleek and eco-friendly, the Women's Guard TYReco Dimaxfit Swimsuit is a triple threat. Our one-of-a-kind TYReco textile, constructed from recycled fabric, requires less energy to produce, creating a lower level of CO2 pollution. Featuring a medium neckline and innovative thin strap binding system, our Dimaxfit swimsuits are built for athletes who want reliable coverage during every swim. With an oversized guard logo for rapid identification, the DMGU1A is ideal for both pool and beach use. In addition to providing a long-lasting fit, UPF 50+ protection and chlorine resistance, this fully lined swimsuit is offered in multiple color options. I have worked as a guard for over 3 years, and the most comfortable suit that I have found is this one. The suit is comfortable enough to wear for a long amount of time. It dries really quickly, is super comfortable material (even the straps), and they last for a long time. I had two that I rotated between, and they lasted me for two summers of 10+ hour days. A: Thank you for your inquiry. Unfortunately we're not sure what you are referencing with "52" as size 42 is the largest size offered. The sizes shown are based on competitive swimsuit sizes, but can easily be converted using the "Size Chart" tab, (which is the 4th tab beneath the product image). Q: Does this swim suit come with a built in bra? A: The Guard Dimaxfit Swimsuit does not have a built-in bra / cups however, the suit does have a layer of lining (front and back) to combat transparency concerns.